The new Victoria Fountain was unveiled on Wednesday the 23rd of July. The long-awaited eastern section of the Manchester orbital motorway will go ahead as planned. The decision was announced by Transport Minister Gavin Strang in the House of Commons today. Building work was suspended in June when the Labour government announced a review of all new roads. The five-mile gap in Manchester's motorway system extends from the M66/A576 roundabout at Middleton, near Heaton Park, down to the M66/A57 junction near Denton. Work is already well advanced, though a group representing Daisy Nook Country Park, near Ashton, are against the motorway. "Friends of the Earth" were also said to be disappointed that the government decided not to abandon the project. Meanwhile in Cheshire, councillors have decided to delay a decision on whether to widen the M6 to four lanes. Mobberley residents travelled to London on Tuesday to lobby MP's and hand in a 6000 signature petition to Number 10 Downing St asking for the second runway to be scrapped. They were supported by Terry Waite and Martin Bell. A separate legal procedure is also taking place in Europe, as the EU considers an appeal by the anti-runway group. A new massage and aromatherapy centre is to open at Manchester Airport, and it is claimed it will be the biggest of any airport in the world. The "Wellbeing Centre" should be in operation by the end of the year, helping passengers cope with the strain of air travel. Manchester bin men went on strike in the middle of the week over the suspension of a colleague after a street cleaning machine overheated. Collections in some part of the city were disrupted, but no major accumulation of refuse occurred. And fire brigade men say they may be forced into industrial action soon: The union claims Greater Manchester Fire Authority wants to cut 36 jobs and three appliances. The conjoined twins born recently at St Mary's Hospital, and separated in a seven hour operation at Great Ormond Street Hospital, London, have survived and should grow up to be normal and healthy adults. The twins Aoife and Niamh (pronounced "eefa" and "neeav") McDonnell were born to Joan Varley, of Manchester. Their identity was previously not disclosed in order to ensure the privacy of the family. They are the first set of "Siamese" twins to survive after separation. 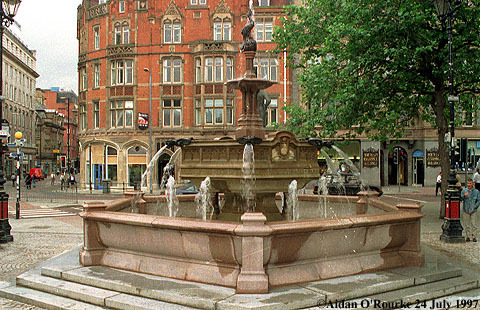 On Wednesday, a 100 year old fountain restored to its original location in Albert Square, was switched on by Deputy Prime Minister John Prescott, who was in town on an official visit. The fountain was first erected in 181997 for Queen Victoria's diamond jubilee, but was moved to Heaton Park thirty years later, where its condition gradually deteriorated. Craftsmen have been working on the fountain since early in the year, and the finished monument looks very impressive indeed. Yours truly was featured on television this week photographing the newly restored fountain and placing it into this page of the Newsletter. Greater Manchester's reputation as a playground for car thieves and so-called "joyriders" was enhanced on Thursday night when a car chase took place involving police patrol cars and a stolen Toyota Celica. The pursuit extended through Stockport, Salford and Bury. The vehicle was finally stopped in Stretford using the "stinger". All three people in the car were arrested. The "stinger" has been featured on "X Cars", a BBC "fly on the wall" series showing the work of Greater Manchester Police X Division, which specialises in vehicle crime. The "stinger" is a metal pantograph or jointed framework with upturned spikes. A concealed officer extends it out into the road just at the moment when the offenders (and hopefully not an innocent motorist!) are passing, causing the tyres to be punctured, and the vehicle to come to a gradual stop. The offenders can then be arrested. On Saturday, a horrific accident occurred on the M62 at junction 21 near Milnrow, when a car was trapped by two articulated lorries. The two occupants of the car, both men, were killed. There were 16 mile tailbacks in both directions. As I drove past there on Saturday evening, a coned off section of twisted crash barrier bore chilling witness to the incident. A similarly dreadful accident, involving a car and two buses, occurred almost exactly 50 years ago in Chorley. Read about it in Manchester Eyewitness. Other fatal accidents have also occurred over the past few days in Derbyshire and St Helens. It's been a mixed bag of weather this week, with high temperatures on Tuesday and Wednesday, followed by heavy showers and cooler temperatures on Thursday and Saturday. There were fog patches and bouts of heavy rain on the M62 on Saturday night, but Sunday was bright and sunny. Today started cloudy but quickly brightened up. Clouds and rain are forecast for later in the week.